A campaign to store emergency contact details in mobile phones, which was first launched in the East of England, is set to go international. The ICE campaign, which stands for in case of emergency, was the idea of paramedic Bob Brotchie from Suffolk. The idea has since been backed by East Anglian Ambulance Service and later by Welsh ambulance officials. New York police have now invited Mr Brotchie to explain to officers in the United States how the idea works. 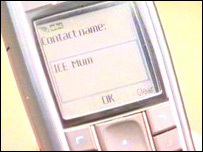 The campaign encourages people to store the word ICE in their mobile phone address books, next to their next of kin's number. East Anglian Ambulance NHS Trust recently quashed rumours that it was a hoax . A prank e-mail had claimed that entering the acronym would unleash a virus that drained pay-as-you-go phones of credit. Both organisations have asked customers to ignore the claim, which they branded malicious.